THE 2016 SPEED ACADEMY COMBINE! Would your season benefit from a boost of intensity? The NFL Combine takes place every February to showcase all the up and coming talent in American Football. So, on 31st January, I’m organising The Speed Academy Combine in Horsforth! Open to young athletes from all sports, it will be a series of sports specific tests to see who’s got it and who hasn’t. Train hard for each event and reinvigorate your season! 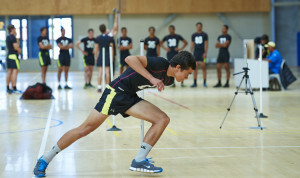 This unique event replicates many of the tests used by the very top professional academies in rugby, football and the EIS. It is a massive opportunity for young sports people to work hard on certain universal sports skills and pit their abilities with friends, teammates and athletes from other sports. This testing event will highlight where they are strong and what needs attention. Each test has a scoring structure, a bit like the decathlon in athletics. The athlete with the highest total in the 2 age categories (11-13 and 14-16) will receive 1 term FREE membership to Speed Academy (value up to £175) or a half day Speed Camp for their team (value up to £300). There will also be on the spot prizes of training apparel for outstanding individual performances. If you find that your athleticism is holding you back, then you’re in the right place. That’s what we do! Is It Worth Screening Young Athletes? I know there are many coaches out there that believe that you don’t need to screen athletes. Just seeing how the athletes deal with certain drills and exercises tells them all they need to know. Well I apologise now, but I’m not that good. Firstly, when you have a squad, it’s hard to objectively look at the specific movements of every member and glean all the information you need. You may pick up that Jonny’s on his toes too much, or is posturally weak and struggles with stepping off his left foot. Or that Jenny’s knees collapse inwards when she jumps or changes direction. Over the course of the first few weeks of preseason it becomes clear what each player can and can’t do. How is that going to direct the programme? Do you have a strategy to clear up the movement issues? Or do you just hope that your programme and coaching skills are robust enough to develop them through it? If you’re reading this then I’m sure you’ll already know that you can’t develop a skill if the players don’t have the required movement ability to execute it. So this is a problem holding the team’s development back. This is why I screen ALL my athletes. Just so you’re clear, I’m not talking about a medical screen or genetic screen or anything like that. This is just a simple Movement Screen that highlights any basic movement dysfunctions. After the first session, I now know what each player’s problems are. Not only do I know WHAT they can and can’t do, but more importantly I know WHY. What does each individual athlete need to work on to get to where we want them? What do I need to include in the session? Is it Movement Quality, Strength, Power, or Technical Skills related to their sport? Without a good screening and testing procedure set up, how will I ever know? Screening young athletes is a vital step in the training process. I take the time to do a movement screen (as well as the performance tests) with each and every athlete that joins one of my programmes. This directs what to work on during each training session and how each person can can get maximum benefit from the programme. It’s my responsibility to enhance each athlete’s performance when they come to train with Speed Academy. After all…that’s what the parents are paying for, right? They’re paying me to help their child get more from their sport. Whether that’s to make them more competitive in a performance setting, or to get a more enjoyable experience from sport leading to a healthier relationship with exercise in adulthood. Most athletes tend to spend a lot of time working on the technical skills of the sport. I think all NGBs now understand that technical proficiency is critical. But for every specific skill, there is a certain physical demand. If the movement skills and athleticism aren’t there in the first place, then execution of a skill will be impossible no matter how good the coach is. “you need the physical qualities in place to do the skills work, and the specific skills to do the tactical work, in that order.” Or something to that effect. This struck a chord with me as it seemed at the time that many clubs and coaches were only really working on the skills and tactical side. So they’re just waiting to be given a great athlete so that they can turn them into a football or rugby player. The problem here is that some kids move brilliantly at a young age, then grow a bit. This growth spurt causes them to lose control of their limbs and posture, start to move a bit like C3P0. Because of this, they have to adapt the way they move to account for the lack of stability and mobility. Many never recover from this as the new, less efficient movement patterns become engrained. There are other young athletes that have the perfect attitude, co-ordination and awareness, but are physically easily dominated. These players are often missed and it’s too late when they catch up ini the late teens. The opportunity has gone. The potential was there, but completely overlooked. Gray Cook a Physical Therapist from the States came up with the very simple Functional Movement Pyramid. This pyramid consists of three different blocks, or primary focuses, that need to be addressed to improve sporting performance and explains in a picture what I think Kelvin was saying..
Movement is the base of the pyramid and establishes a base for us to work from. Without good, clean efficient movement…performance will be decreased and injury rates are sure to increase. I have noticed over the years that in order to play at a high level, my athletes need to be able to squat, lunge, step, reach, push, pull, and crawl. I first recognised the effectiveness of this approach with my golfers. For a long time I’ve worked closely with a very good golf coach called Mark Pinkett. Early on in our relationship, Mark sent a young payer to me because he saw the value of athleticism in golf. As always, the first thing I did was screen him. Now he might have been 16 and playing for England, but not knowing much about golf at the time, I just treated him like any other athlete and stayed true to what the screen was telling me. I wanted to see him be able to master the basics of movement. So for the first 6-8 weeks we just focussed on specific mobility, stability and posture to enable him to perform basic movements such as squat, static lunge, push and pull. “Just some foundation stuff, why?” Keeping my poker face. We’ve worked together on a lot of players since then and we’ve never failed to get at least 25yds or dramatically improve consistency. This experience with those golfers highlighted to me the importance of movement screening and creating the broadest foundation possible in the time I have with an athlete. You can build a beautiful house on sand, but it won’t be long before it crumbles and you have to start again. Using the Functional Movement Screen, I am able to screen each athlete and see what we need to work on. This sets up everything else and enhances performance. Next, we want to attack the performance level. If they are moving well, this is where we will reinforce that good movement by loading it using resistance exercises. A good strength and conditioning program will help reinforce proper movement. Resistance training will basically tell the body we like what we see. If we like the movement, we want to load it. We want to tell the body this is good, so strengthen and reinforce this movement. That’s why the base is so important. If we start to strength train on a poor base of support or movement, we’re going to reinforce faulty, inefficient movement. You will undoubtedly get some gains in performance, but what you have is an over-powered athlete. This is an injury waiting to happen. Imagine putting an F1 engine in a beat up Fiesta. Fast yes. But it’s only a matter of time. Clean up the movement first, and then move into some traditional strength and conditioning routines to build a stronger, more powerful athlete. Finally, the top of the pyramid is the last thing we want to focus on. This stage is important, but building a solid athlete begins by working on building a foundation…A foundation based upon being strong and moving well. If the athlete is weak or moves like crap, there is no amount of skill work that will help enhance their game. During the offseason, we focus primarily on the bottom two blocks of the pyramid. We want to build each athlete up by laying a foundation of good, efficient movement capacity. After we like what we see there, we start to reinforce that movement with strength and power work. Finally, as the season gets a little closer, we will start to integrate more skill work in their programming. We may focus more on sprint, cutting, deceleration, reaction skills, and other technical skills related to being a good athlete. However, we only focus on this phase if we have established a proper pyramid based on movement before performance and then performance before skill. The short time it takes to run a good screen helps guide the development of a game plan for each athlete. Whatever the scenario is, a good screen will help apply the best plan of attack in addressing the weaknesses of each athlete or the team as a whole. Taking the time to screen on the front end reaps huge benefits if the info found is used appropriately.